Sebastian Serrato, a junior studying graphic art, plays his group’s video game, “Confinement,” Tuesday, May 8, 2018 during UTRGV’s Game Showcase in Edinburg. Students from computer science and art came together to program their own games. 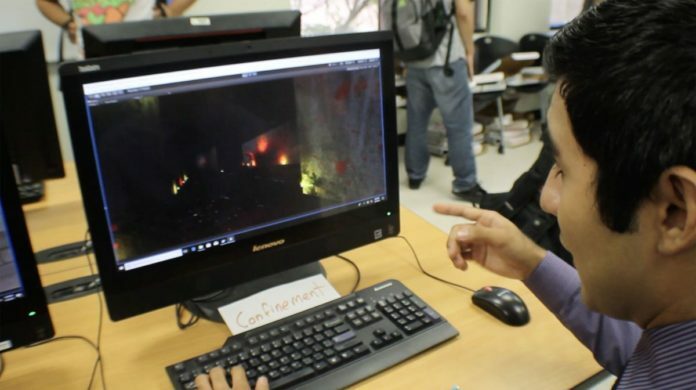 A University of Texas Rio Grande Valley computer lab bustled with sounds of clicking keyboards Tuesday as students played and ranked their favorite student-made video games. The games were created as a final assignment for a pair courses — one computer science and one art — which collaborated on the projects. Donna Sweigart, UTRGV associate professor of art, and Emmett Tomai, UTRGV associate professor of computer sciences, came together about five years ago to integrate parallel, multidisciplinary courses. Students enrolled in Introduction to Game Development through the College of Engineering and Computer Science, and Special Topic-Game Design through the College of Fine Arts, meet once a week with their respective classes and once a week all together. “It’s a neat way for them to take what they’ve learned in the abstract and turn it into something they can see, touch, feel and be proud of,” said Tomai of the games. Artists were responsible for the aesthetics, while computer scientists applied the textures to 3D models and made sure games work. Students relied on an online file-sharing program for coordination and communication, instructors said. The previous project was a two-dimensional game, which Sweigart said was more innately suited for students’ skill set. The final was a three-dimensional project programmed in four weeks. Some students, like senior computer science major Zachary McDonald, said building a game was initially easier than he thought. “But when you dive into it and you realize everything that’s going on, it gets ridiculously tough,” he said. Sebastian Serrato, a junior studying graphic art, spoke about his group’s game, “Confinement,” which requires players to find a key within a maze and avoid monsters. He said while his team members’ interests span the gamut of gaming genres, crafting a horror-based project was something they could all agree with. Serrato designed the monster on paper and pen before 3D modeling the character via a free software, Blender. He combed through tutorials learning how to better mold the limbs. “It was very challenging, because a lot of us here had never messed with the 3D software,” Serrato said. The course offers students a chance to “test the waters and see if this is something they’re really interested in, either working in a team structure, game design or 3D modeling,” according to Sweigart. McDonald said game design would likely be a hobby versus a career, but junior computer science student, Robin Belo, expressed an interest in pursuing a future in the indie games industry. Former class alumni have pursued postgraduate work in related fields, Sweigart said. The cross-college collaboration has also led to a research grant funding the UTRGV Fabrication Lab located in the Visual Arts Building in Edinburg — where students can design products through a modeling software, then produce them through various equipment. “It’s really amazing to have a colleague from a completely different area to reach out to,” Sweigart said. Staff writer J. Edward Moreno contributed to this report.